WOW! Large cul-de-sac lot with PREMIUM MOUNTAIN VIEW & fantastic GREAT ROOM FLOOR PLAN! You'll love the GAS FIREPLACE, gorgeous PLANTATION SHUTTERS, tile in all the right places and LARGE KITCHEN with GAS COOKING, big island + breakfast bar too! Don't miss the LARGE BACKYARD, expanded Saltillo Tile Patio with SUPERSTITION MOUNTAIN VIEWS, multiple seating areas, water feature, view fence & RV GATE to large, private side yard (room for your ''toys and stuff'')! Located in one of the most sought after subdivisions in Gold Canyon! 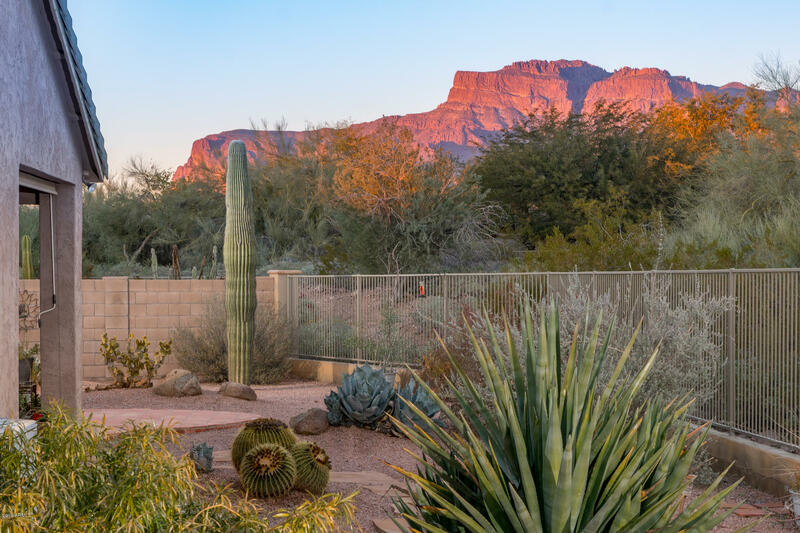 The low HOA fee of only $45 is unheard of for the amenities offered including...heated community pool and spa with great views of Superstition Mountain, pet-friendly park and 52 well maintained, fantastic walking and hiking trails + WALK TO SHOPPING & DINING!